Luxury watchmaker Hublot, bought by LVMH Moet Hennessy Louis Vuitton in 2008, aims to present the one-of-a-kind $5 million Big Bang Lady Watch next year. The Swiss brand, which sold a $3 million Big Bang model within a day this year, is upping the ante by creating its most expensive timepiece ever, encrusting it with as many as 300 carats of diamonds to grab the attention of its new target market: ladies’ watches. Women are buying more than men, women are buying more often than men and women are very influential over men, so you have three good reasons to work on this population, said Jean-Claude Biver, Hublot’s Chief Executive Officer. According to researches by the company, the niche market of ultra-luxury ladies watches has grown in volume over the years, and is expected to grow approximately by 30% from 2010 to 2015. Hublot isn’t the only watchmaker catering more to women, a market worth $3.9 billion last year. As women increasingly see watches as an investment, Swatch Group AG (UHR)’s Omega last year introduced its Ladymatic self-winding watches, which sell for as much as $42,700, while Patek Philippe started selling a ladies’ chronograph in rose gold this year for about $478,000. It’s so astonishing, Biver said. Women don’t want to buy what is called a ladies watch; they want to buy a watch with personality. Ten or 20 years ago, we would have sold zero because women didn’t want big watches. About a third of the 30,000 watches Hublot makes each year are now adorned with precious stones, according to Biver. About 80 percent of the timepieces adorned with gems are purchased for women. 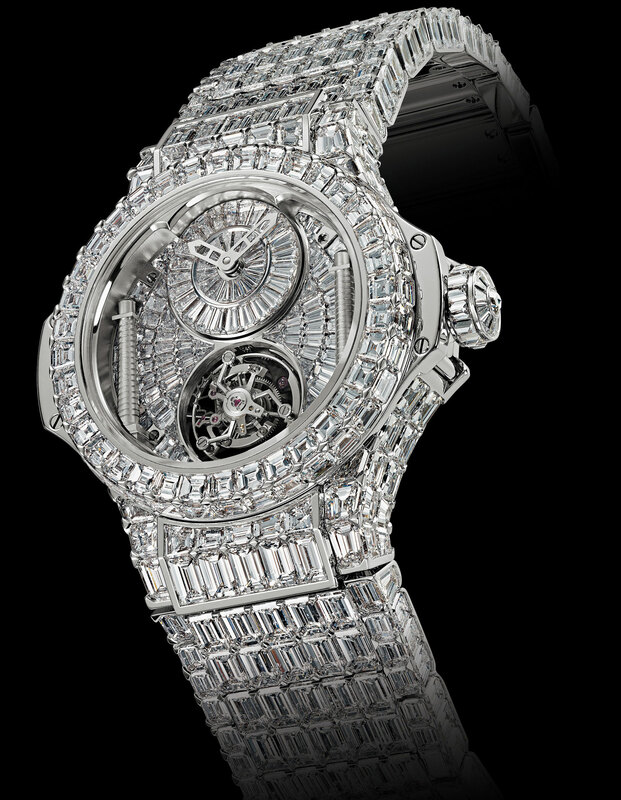 Hublot sold eight $1 million diamond watches over the past two years, mostly on demand, according to Biver. The company is currently making a second $3 million watch for a customer. So if you have a spare $5 million lying around the house, why not pamper yourself a little. 30,000 pieces a year is hardly exclusive – it is merely ‘expensive’ and mass produced high net worth crap! It’s hardly a Bugatti Type 41 Royale.